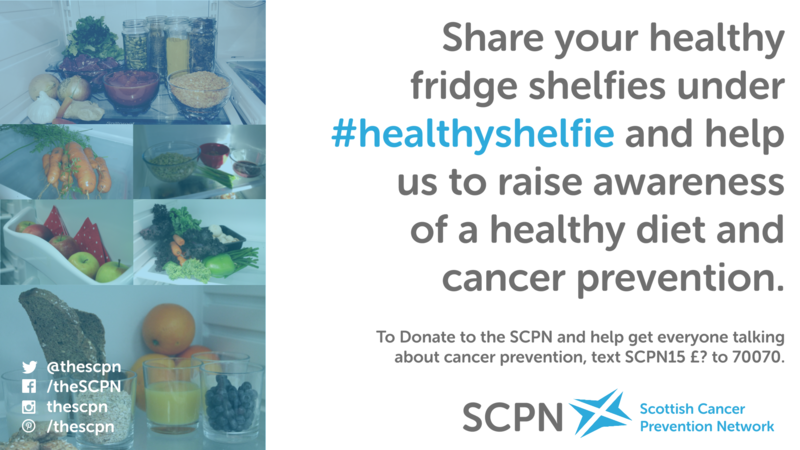 January 2015 is the month of the #healthyshelfie, our latest social media campaign designed to help raise awareness about the preventability of cancer. We are focusing on the content of fridge shelves, and have asked/nominated folks to share their fridge contents with us and help illustrate all the lovely goodies that make up a healthy diet. Each day next month, we will be sharing a #healthyshelfie of our own, but you can help us get everyone talking about cancer prevention by sharing your own! You can also help by sending a donation or sharing donation details with your friends and family. Simply text SCPN15 and your amount (e.g. £5) to 70070, and your donation will be taken from your phone bill. We’ll be sharing on Facebook, Twitter, Instagram and Pinterest so keep and eye out next month – we look forward to your support!